These days it’s impossible to go for a walk on a beach, anywhere, without seeing huge quantities of disposable plastic waste. All over the world the statistics are ever growing. Both staggeringly and frighteningly millions of tonnes of plastic debris are discarded every year polluting lands, rivers, coasts, beaches, and oceans. It is time to open our eyes and take responsibility. Realistically, we can’t expect plastic to disappear overnight but there is a solution: We must move away from single use towards reuse and as such, here are our top 5 reusable products to help get you started. Remember: “It’s only one coffee cup… said 8 billion people”! With startling figures such as 20,000 plastic bottles bought every second and 99.75% of coffee cups not being recycled, we cannot ignore how harmful disposable coffee cups and water bottles are for the environment. They are most likely the biggest disposable plastic waste issue the world faces today. Luckily, it’s a problem that’s easy to sort. It is time to start carrying our own reusable bottles and cups around with us. However, these items are bulky and can take up a lot of room in our bags which is why our number 1 recommendation is Climate Cups. This clever company has solved the problem for us with their colourful and convenient designs. 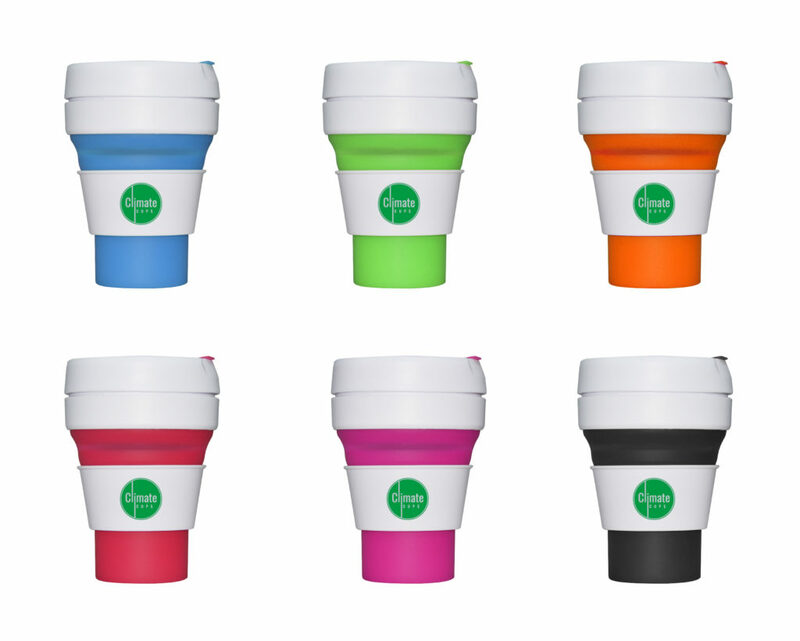 Climate cups offer coffee cups and water bottles that collapse to fit in your backpack, handbag or pocket leaving us with no excuse not to bring our own cups/bottles with us. They even state that the cups will pay for themselves as most coffee chains offer discounts for customers who bring their own cups – 18 coffees at Pret A Manger and your cup is paid for! Plastic bags have only been in circulation for about 50 years, and as such it’s hard for scientists to give an exact figure of how long they take to fully decompose. It has been suggested that these throw away bags could take up to 1,000 years to decompose which means every single plastic bag ever used is still clogging up the planet, littering our public spaces and damaging wildlife around the world. It is a no-brainer that we all bring along our ‘bags for life’ to do the shopping. The Future Kept take this concept quite literally, designing and carefully sourcing items that are better for our world, moving away from disposables to form an intimacy between you and your belongings. They offer a range of beautiful bags, including those made out of unique washable and durable paper so that you don’t have to sacrifice style in your efforts to be environmentally friendly. There are approximately 8.5 billion disposable plastic drinking straws used annually in the UK alone and an astonishing 500 million used daily in the USA, making them one of the top 10 piece of debris found upon our beaches and coastlines. Ecostrawz have made it their mission to assist individuals and businesses around the world in drastically reducing, and eventually eradicating, their use of disposable, single-use, plastic drinking straws by offering an extensive range of unique, high-quality, sustainable alternatives that are not only good for the environment, but are also better for your health, great to look at and fun to use. Billions of plastic straws litter beaches around the world. Brushing our teeth is an automatic part of our daily routine, until recently we haven’t given it much thought but thanks to the rising awareness of plastic pollution, more of us are reconsidering our everyday choices. An estimated 3.6 billion plastic toothbrushes are used worldwide every year, and 80% of these end up in the sea posing risk to marine life and destroying natural habitats. The Pearly White Club offer a unique, low cost toothbrush subscription service without the plastic consequences. They deliver a brand new, natural, bamboo and biodegradable toothbrush to you every 6 weeks, offering you a convenient and environmentally friendly alternative. They have also partnered with a homeless charity, donating a toothbrush to the shelter for every subscription. Every day items contain non-recyclable plastic that can pollute the planet for thousands of years. We consume single use plastic daily, it is so ingrained in our day-to-day lives that we may not even realise how much plastic we consume – from cling-film and tinfoil at home to lunches on the go and plastic cutlery. Onya reusable sandwich wraps are made from recycled plastic drinking bottles. The wraps are versatile and easy to clean, allowing you to transport your deli meats and cheeses from the supermarket, sandwiches from the local café or lunches from home for a picnic. Start thinking about where you can cut back to reduce your single use!